The first transnational project meeting of the Erasmus+ project Hob‘s Adventure was held from 15th to 19th of October 2018 in Tallinn, Estonia. Project partners traveled from Iceland, Slovenia and Latvia to attend the meeting, which was hosted by the two Estonian partners NPO HARED, Center for Training and Development, and Lehola Environmental Education Centre. All in all, there were 12 project partners in attendance. The first day was dedicated to getting to know each other and then diving right into the project tasks and roles. Sirje, Georg and Martin Aher from HARED facilitated the meeting beautifully, and ensured the group also got to take in the inspirational new indoor and outdoor facilities of Lehola EEC in Pirita Kose kindergarten with our hosts Mairi Enok and Kadri Ott. 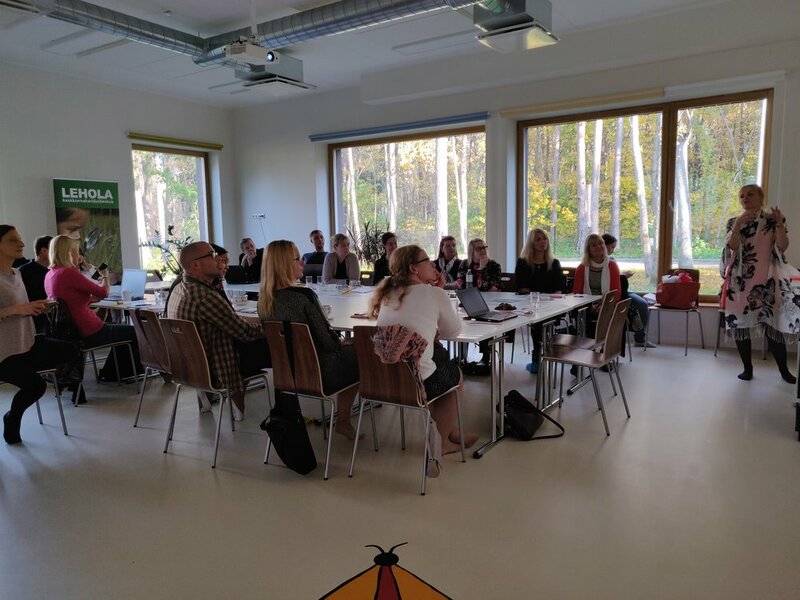 In addition to the 12 project partners, many kindergarten and primary school teachers from Estonia that will participate in the project attended part of the meeting to share their experiences working with environmental education. Partners from abroad got to ask questions about how they are working with the Eco-Schools framework in Estonia and how each school uses their unique approach to nature-based learning and environmental goals for their school. The group also got the great privilege of visiting two secondary schools in and near Tallinn to experience those schools and their school cultures firsthand. Both were large, urban schools for children aged 7-18. The project partners were impressed with how they emphasised movement and health as part of their environmental projects in addition to ambitious goals for recycling, eco-friendly transportation, and using nature as a learning tool as well as a learning goal. We even got to take part in a dance break. The team surmised that the teachers and schools have already incorporated hands-on learning methods, digital tools and physical activities in their daily routines. This will provide for an excellent stepping stone for our project, allowing us to build on past successes and connect trailblazers from different institutions and countries. Finally, the project team ended the meeting at Lehola‘s Mustamäe location to finalise project business as well as learn how kindergartens and schools utilise bots for engaging pupils in learning about biodiversity and nature. After a fantastic three days of meeting, the group said good-bye to each other until the next transnational meeting in February 2019 in Latvia.